FORT LAUDERDALE, Fla. - A FedEx plane caught fire Friday afternoon at Fort Lauderdale-Hollywood International Airport. 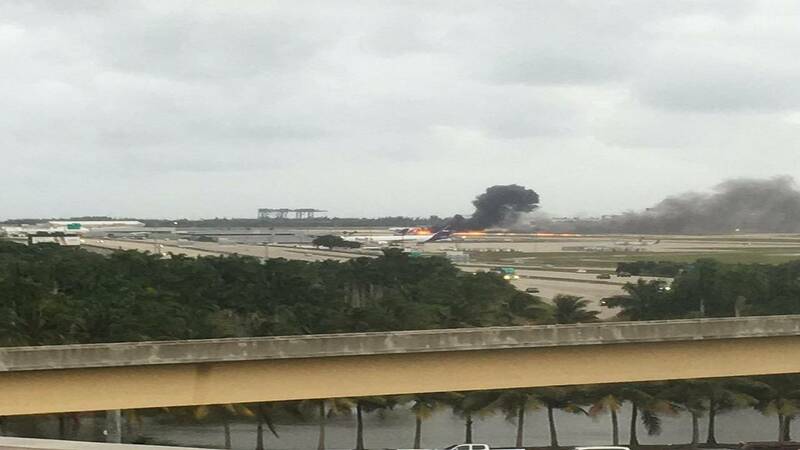 Broward Sheriff's Office Department of Fire Rescue spokesman Mike Jachles said firefighters were called to the airport shortly before 6 p.m. after smoke was seen coming from the plane. A photo sent to Local 10 News shows the plane on fire. The fire has since been extinguished. According to Federal Aviation Administration spokeswoman Kathleen Bergen, the landing gear on the DC-10 aircraft collapsed, causing a fire as the plane was rolling on Runway 10 Left. "I think the pilot did a pretty good job of keeping it close to the runway, but of course you can see the ball of fire and with all that fuel, that was a pretty big explosion," said Stephen Lloyd, former safety director for the FAA. Bergen said the plane had just arrived from Memphis, Tennessee. She said both pilots escaped from the plane. A ground stop was in effect at the airport until Fire Rescue cleared the scene. The plane had 40,000 pounds of fuel on it when it was coming in to land. The north runway was damaged, but the extent of the damage was not known. The airport was re-opened at 7 p.m. Friday, but only the south runway is operating. Authorities said the north runway will remain closed as Broward County Aviation Department workers assess the damage to the runway. A timetable on when it may reopen was not given. A dozen or so flights were diverted to area airports. The airport is operating, but passengers there can expect some delays. A National Transportation Safety Board team is investigating the cause of the incident.